An India pale ale and a sunset over the Pacific Ocean. A doppelbock and awe-inspiring Alpine peaks. A cask ale and shimmering skyline lights. 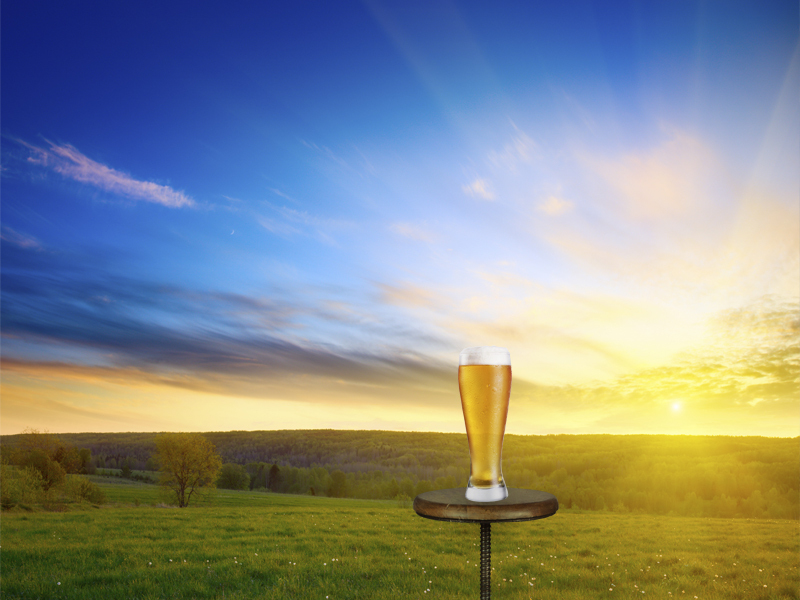 Sometimes beer pairs best with a view and a breath of fresh air. That’s why we scoured the globe to find breweries, bars and restaurants with magnificent scenery and outdoor seating. While the settings vary, there is one constant: Spectacular beer is always on the menu. So stock up on sunscreen, seek out these places, and raise a glass to Mother Nature. This story appears in the July issue of All About Beer Magazine. Click here for a free trial. Western Greenland has spectacular views and some fine craft beer. One of my most memorable outdoor drinking experiences was drinking Greenland Mountain (Brown) Ale and Greenland Iced Flower (Pale Ale) on the outdoor deck of the Hotel Uummannaq, overlooking the town harbor and the icebergs that filled Uummannaq Icefjord, located nearly 600km north of the Arctic Circle. Yes, I have photos. Devil’s Backbone in Roseland, VA and Blue Mountain in Afton, VA. Both are on the “Brew Ridge” trail and both over beautiful Appalachian Mountain views with fantastic craft brews. You missed Voss Bryggeri in Norway! You can find them in the city of Voss in the norwegian mountains. They won the price for Norways best newcoming beer last year. You can enjoy worlds best beer on the terrasse while you enjoy the fantastic wiev over the high mountains,fields and the city of Voss. You can sit outside in the long norwegian summernights and have the best time of your life:-) Or you can go there in wintertime, and enjoy snow, dark nights under the stars and go skiiing. The beer is brewed with passion and mixing old traditions with new ideas. The best place in the world to drink beer: Voss brewery in Norway. I would add Augusta Brew Haus and Bier Garden in Augusta Missouri. The bier garden overlooks the Katy Trail and the Missouri River. It is a great place to rest and watch the world go by. And the beer is most excellent! The Green Heron Club is riverside on the Dan River in Stokes County, NC. The 58 foot back porch over looking the Dan River is the place to enjoy one of fifty beers and 25 wines by the glass. Live music on Saturday nights. Wine and painting on Wednesdays. Adjacent to Hanging Rock State Park and a Blue Ridge Music Trail location. Hey Doug: Pisgah is on the list, included in the writeup with Highland on this page: http://allaboutbeer.com/article/beer-outside/5/. Thanks for reading. Great spots for the northeast. As I live in NY and travel to Maine yearly, one more spot in Me.comes to mind. The Seadog brewpub in Topsham, Me offers a spectacular view/setting on the Androscoggin River. Not to mention great beer and food. Check them out! 49th State Brewing Co. Denali Park Alaska. For what it’s worth I’d find it hard to go past Smuggler’s Creek Inn, Donegal Ireland. Monhegan Island is located 10 miles off the coast of Maine. No vehicles allowed, just amazing beauty that inspires artists,photographers, and hikers. Monhegan Brewing is the place to go after a great day on the trails hiking along the 160 foot cliffs. Another can’t miss experience. Must have a Kinsale Pale Ale at the Bulman with the sunset over the harbor. Should add Mecklenburg Gardens in Cincinnati , Ohio. Authentic German Beer Garten,it’s been around since 1865! Just visited the Kern River Brewing Co. a couple of weeks ago. This place is in the middle of nowhere but what a ride getting there on our way from San Diego to San Francisco. A great view from their patio and some great beer to go along. Also, I recommend staying in the Kern Lodge next door for some old-school motel accommodations. Thanks for the recommendation. Well worth the trip!